The Accessibility for Ontarians with Disabilities Act, 2005 (AODA) is provincial legislation that aims to achieve a fully accessible Ontario. The Act makes Ontario the first jurisdiction in Canada to develop, implement and enforce mandatory accessibility standards. It applies to the private, public and volunteer sectors. EastGen values our customers, visitors and employees and we strive to meet everyone's needs. We are committed to providing quality goods and services that are accessible to all persons that we serve. 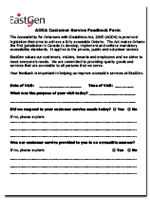 Your feedback is important in helping us improve accessible services at EastGen. For more information please contact our Human Resources Department at 1-888-821-2150. EastGen realizes that providing accessible & barrier-free environments for everyone is a shared effort. 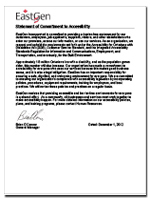 As a community, all businesses & services must work together to make accessibility happen.